All these posts are of my own thoughts and do not reflect the opinions of my school. I hold a degree in Child Development from Connecticut College and a M.Ed. in Special Education from George Mason University, as well as certification in Leadership and Administration from Sacred Heart University. Sharon Plante, an educator with 22 years teaching experience in special education, has been an educator at The Southport School (formerly Eagle Hill-Southport) for over thirteen years, as well as currently serving as Director of Technology. She utilizes her educational training and love of technology to engage students with learning disabilities in building their skills and finding success. 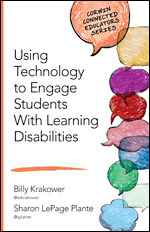 Sharon is the co-author of Using Technology to Engage Students with Learning Disabilities. She was awarded the 2016 Distinguished Alumni Award from George Mason University College of Education and Human Development. She has presented at International Dyslexia Association, Everyone Reading, EdRev, Edscape, ATIA (Assistive Technology Industry Association), and New York Chapter of ALTA (Academic Language Trainers Association), as well as at several EdCamps, on using technology to empower the dyslexic learner. Sharon was the 2015-2017 chair of the Connecticut Association of Independent Schools Commission on Technology. Sharon is a co-founder of #edtechchat, and co-organizer of EdCampSWCT. You can follow Sharon on Twitter @iplante, where she regularly connects and collaborates with educators from across the world. Is she the host of Learning Differently #SpedChat on iTunes? I’m trying to get my APA references for my Master’s in Ed class.